I was introduced to backpacking/tramping/hiking as a young child in Boy Scouts and through my school physical/adventure education. After leaving school, I mainly did short daywalks until recently when I started to re-walk some of Tasmania's key routes and try others I have yet to attempt. I mainly walk in the winter months, in Tasmania's central highlands area. I prefer light gear, extended walks (3-5 days) in a group of 3 people, or shorter walks (1-3 days) walking solo. I generally carry a base weight pack of around 8 kg - 10 kg (17 lbs - 22 lbs). Described by Outdoor Research as a lightweight, button up UPF 30+ protection shirt that is just as suited to a days hiking as it is to a night on the town. The SoDo Shirt is available in both short sleeve and long sleeve models with sizes ranging from Small to XL. There are 3 colour options, Barley, Balsam and Abyss. I am testing a short sleeve model in size Medium with the Barley colour. As far as shirts go, they're not an overly technical item, and the SoDo is the same in this regard, it is designed to simply be comfortable but a bit more stylish. I have a couple of items of gear also made by Outdoor Research and I hold them in high regard as a producer of high quality functional gear. The SoDo shirt certainly feels lightweight and appears to be very well constructed. From the moment I received the SoDo, I was immediately concerned that I may have ordered the wrong size. As there is no actual sizing chart available on Outdoor Research's website for this particular shirt which is a surprise as many other items on the site have sizing charts. I selected a size Medium as I have a lightweight jacket also made by Outdoor Research in the same size that is an excellent fit. This shirt did not at first strike me as being a 'great' fit as it feels very baggy and loose, and although a short sleeve, the sleeves still come to my elbow. Despite this, I actually have plenty of room around my shoulders and doubt I could fit into a size small comfortably. I would also not be able to button the collar at the top button. The general fit does feel a little sloppy and my personal preference would be for a slightly more slimmer fit, particularly if I was wanting to wear this shirt in a more urban setting rather than out in the wilds. The front of the SoDo features 2 large pockets, a traditional top 'loading' pocket with a button closure, and the napoleon pocket, which is side 'loading' and features a zipper closure and media pocket. When I discovered the media pocket, I did what any sensible, technology addicted person like me would do, I grabbed my iPhone to see if it would fit! I was delighted to discover it slid straight in and feels secure in the pocket. I imagine this is a feature I will use a lot. One thing that is a little strange to me is the fact that the button holes are horizontal on the SoDo, where nearly every other shirt I own has vertical button holes. As a result I initially found it a little hard to button up the SoDo. The buttons, which are made of a lightweight alloy, also seem a little small to me which also made it just that little bit harder to button up the SoDo. I am sure that this is something that after a few times wearing this shirt I will not think anything more of. Once on, the SoDo feels extremely comfortable and lightweight. I can easily move around without any restriction and the overall fit has a very relaxed feel. As previously mentioned, I find the fit is a little baggy but this will obviously assist ventilation and help keep me cool and dry in hot and humid conditions. Overall, I was highly impressed with my initial wearing of the Outdoor Research SoDo shirt. It is comfortable and appears to be well constructed from quality materials. I do like the slightly more 'stylish' design of the shirt and would feel comfortable wearing this shirt not only out in the wilds, but also kicking around a bar with my mates in warm weather. However, as it is currently winter for me, it is a little cold to get around in a short sleeved shirt.I plan to give the SoDo a good and proper testing on an upcoming trip to East Timor, which will be extremely hot and humid!!! I will spend a lot of time in jungle and rural areas which I anticipate will offer a good testing ground for this product. 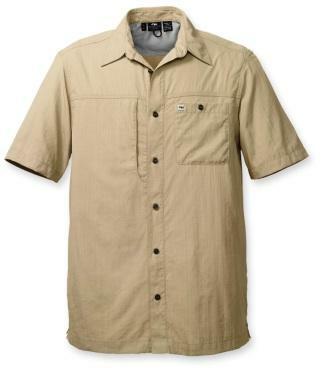 This concludes my Initial Report of the Outdoor Research SoDo short sleeve shirt. Please check back in around 2 months for the results of my field testing. My thanks to Outdoor Research and www.backpackgeartest.org for the opportunity to test this product. During my field testing, I had very little opportunity to wear the SoDo shirt until I traveled to East Timor (Timor-Leste), a small developing country around 640 km (400 mi) north west of Australia. I spent 2 weeks traveling backpack style around East Timor in temperatures between 42 C (107 F) and 20 C (68 F). Humidity was around the 75-85% mark. Elevations ranged from sea level to around 1,500 m ASL (4,920 ft). During this time I would estimate I wore the SoDo around 12 times. I was caught in a rather large downpour at one point but have no idea how much rain fell, but it was a lot! Whilst I was traveling around East Timor I was living out of my 65 L pack. As I was away from home for 2 weeks, I had to be pretty selective of what gear I carried with me. First and foremost I only wanted to carry gear that was lightweight, practical and able to cope with the rough and tumble of being stuffed into my pack and then worn in hot and difficult conditions. I am pleased to report that the SoDo was up to this challenge. In my Initial Report I cited that I felt the style and fit of the SoDo was a little baggy. Having now had a chance to wear the shirt for several days in hot weather, I found that the fit was actually one of the benefits I noticed first, as this allowed for greater circulation and airflow around my body, helping keep me cool. I also quickly discovered that despite coming out of my pack rather badly creased and looking rough, the SoDo quickly dropped this pack look and after I had worn for about half an hour, looked like it had been ironed. Bonus! In general terms the fit and comfort of the SoDo was really good. I do still find the buttons a bit small and the horizontal cut of the button holes catches me out but I am now getting used to this design. The other major benefit I discovered whilst testing the SoDo is that it is extremely quick drying and easy to clean, even when rather dirty. As electricity was scarce and washing machines were even scarcer, I had to wash the SoDo by hand, usually with very limited water. This happened a few times as I found that I could really only wear the SoDo for a day before needing to wash it, mainly because it did start to pong a bit and the collar would become quite dirty. Given the high humidity, I found it really difficult to get some clothes to dry, so much so that I had a cotton t-shirt that was damp for 3 days before finally getting dry, well, before I had to wash it again as it started to stink. The SoDo was washed about 3 times and dried within a couple of hours in the sun. This might seem like a long time but given that I was washing by hand, it was really difficult to get all the water out of the shirt so it was pretty wet when I hung it to dry. I had to dry the SoDo on a rock once as there was no where for me to rig up a line. In addition to being able to dry quickly, I found it really easy to get the dirt and grime out of the SoDo with only a basic liquid soap. A bit of a scrub was required around the collar and armpits to ensure they were clean. Despite this the SoDo always looked nice and clean after I had given it a wash. The other major benefit I was able to test was the sun protection. Whilst I was away I was taking a common anti-malaria medication, which had the unwanted side-effect of making my skin more sensitive to sunlight, and therefore burn much more easily than I would normally experience. Even when wearing a super thin shirt I could feel the rays of the sun burning my skin slightly. I found that when wearing the SoDo I was comfortable and didn't have any issues with burning. I concluded that this was as a result of the SoDo blocking the UV rays. Outdoor Research have designed the SoDo to be more fashionable whilst retaining functionality for backpacking and travel. I was able to test this, in a simple form by wearing the SoDo when traveling for a whole day then having to attend a church mass when I arrived. I was simply able to step out of the vehicle and after a quick wash of my face and hands, step into a crowded mass and l felt that the styling of the SoDo was smart enough without being too formal. Unfortunately I did have one drama during my field testing. I wear prescription glasses, and also have a pair of prescription sunglasses. This means I am always dragging around 2 pairs of glasses with me and I usually just put the pair I am not wearing (eg my normal glasses when wearing my sunglasses) in my shirt pocket. I have no idea how it happened but after wearing my sunglasses most of the day and having my normal glasses in the pocket of the SoDo, I was really angry when I removed them to discover the lenses had got badly scratched, so badly that I will need to replace the lenses. I am not entirely sure I can blame this on the SoDo absolutely but the pocket did feel free from any grit and I assumed the fabric was smooth enough not to damage my lenses. Overall I was really quite impressed with how well the SoDo shirt performed in the hot and humid conditions of East Timor. I found it handy to know that I could stuff it in my pack and when I required a shirt that was a little more 'dressy' than a t-shirt, I could change into the SoDo and still feel comfortable in the humidity. It was certainly a bonus to be able to wash and dry the SoDo quickly which is important when traveling. Now that I am home in Hobart and the weather is starting to warm up as we move out of Winter, I plan to wear the SoDo on sunny day outings. This concludes my Field Report of the Outdoor Research SoDo shirt. Again I would like to thank Outdoor Research and www.backpackgeartest.org for the opportunity to test this quality piece of clothing. I have continued to wear the SoDo during outdoor outings when the weather has been warm enough for me to be comfortable in short sleeves. I have had limited opportunity to take the SoDo out backpacking as I have been recovering from a major knee operation which has left me housebound. Prior to the surgery I was actively training for 2 multi-sport races (races consisting of run, kayak, MTB and road cycle legs) which I am a member of a 4 man team, I am the kayaker. Conditions have ranged from around 5 C (41 F) to a lovely warm spring day of 22 C (72 F). I was lucky enough to avoid rain when ever I was wearing the SoDo. During this phase of testing I was in locations ranging from the beach to large hydro-electric storage lakes at around 800 m (2,265 ft). Overall I estimate I have worn the SoDo around 10 more times during this phase of testing. The more relaxed style of the SoDo proved to be quite handy when out and about as part of the multi-sport race scene. I could wear the SoDo after I had completed my race leg and be comfortable but a bit more stylish than wearing a t-shirt. This proved particularly handy for trophy presentations and photos. The SoDo has remained very comfortable to wear, especially when it is a bit humid and some extra ventilation and air movement around my body is required. In one instance, the SoDo did not recover overly well from some bad treatment where it got covered in dirt after I was at a friend's place (on a farm) and he needed some help moving some earth. I got quite dirty and messy, including some grease type stain on part of the shirt. Again the shirt proved to be comfortable whilst I was hot and sweaty, as well as proving good protection from the sun. Despite 2 washes through the machine, the shirt still looks a little 'worn'. This is the first time this has happened during my testing as the shirt always laundered well and after a quick iron, looked as new. I suspect the quite red soil that I was working with is particularly difficult to get out! I have since soaked the shirt in a laundry treater which has removed 99% of the marks. The care tag clearly states do not bleach this shirt. There was no obvious discolouration after I soaked the shirt. I can still notice the marks simply because I spent so long trying to get rid of them! The care tag also clearly states that this product can not be dry cleaned, which would have been my course of action had the shirt been able to withstand this treatment. Apart from the dramas outlined above, the SoDo has preformed well over the testing period. I have had no issues with the seams or frayed threads. I have also been really impressed with the strength of the buttons and the loop through design appears to be a lot stronger than conventional sewn in buttons. Although in my Initial Report I described that I did not like the size of the buttons, I have got used to them and actually find them no different to normal buttons. I also cited that the horizontal cut button holes were a bit annoying. Again I have become used to this and hardly give it a second thought now. My overall impressions of the Outdoor Research have not changed substantially from my first wearing. I still find the shirt a little baggy but ignoring this, it is a highly comfortable shirt and it is great when the weather is warm and the humidity is up. I certainly found this shirt had my preference whilst I was backpack traveling through East Timor and, once the weather became a warm enough at home, was great option when I was out and about in the outdoors racing or just enjoying nature. Outdoor Research state on their website that the SoDo is 'just as suited to a days hiking as it is a night on the town'. Whilst I would not wear this shirt to a more formal occasion, it is stylish enough to look smart and well dressed in a social setting but practically constructed, lightweight, quick drying and comfortable enough for long days in the outdoors, especially in warmer temperatures. I am now moving into my summer season here in the Southern hemisphere, so I look forward to many days out in the wilds wearing the SoDo as I find it a pleasure to wear and highly suited to the outdoors lifestyle. This concludes my testing of the Outdoor Research SoDo shirt. My final thanks to Outdoor Research and www.backpackgeartest.org for the opportunity to test this quality piece of clothing.